Thousands of people have been camped out in New York's financial district for a week, staging marches to protest the growing gap between America's super rich and the harried middle and working classes. Hundreds have been arrested. Toronto will be the main focal point of the Canadian effort. Protesters are expected to converge at King and York Streets in the heart of Canada's finance and investment centre Saturday morning. The group OccupyTO's website raises the spectre of a New York-style long-term action rather than a one-day protest. "OccupyTO is a movement that will start on October 15th, 2011 that intends to show our solidarity with the Occupy Wall St. movement and stand in unity with the rest of the world to seek and work towards drastic changes to economic systems that are destroying our economy, social fiber, and environment," it says in a statement. Toronto police have said little publicly other than they're prepared for the protest. The city and police service are still dealing with the fallout from the G20 summit protests, where hundreds were corralled and arrested after so-called Black Bloc militants trashed downtown businesses and police cruisers and some officers have been accused of assault. The Toronto Sun reported "hard-core U.S. protesters" hoping to take part in the Toronto action will be stopped at the border. "Our primary goal is that of public safety and facilitating a peaceful protest," Toronto police spokesman Mark Pugash told the Sun. "Despite the organizers' best intentions, some are concerned anarchist protesters from the Black Bloc and other groups could co-opt the protest and turn it into yet another G20-style standoff between police and protesters," according to InsideToronto.com. Protest supporter Thomas Zaugg told Inside Toronto organizers don't want to confront police. 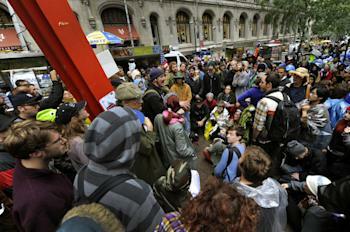 "We have a peaceful message that's non-violent and in keeping with the message of Occupy Wall Street," he said. An online petition is calling for police restraint. "Perhaps, if the Occupy Toronto actions go well, the rift between Toronto and its police that opened as a result of the 2010 G20 meeting can begin to heal," the CBC reported. The Occupy Toronto Market Exchange Facebook page stresses the protest's non-violent nature. Vancouver, which has barely recovered from last spring's Stanley Cup riot, is likely to be the next biggest protest site this weekend. The city's downtown art gallery, the traditional site of demonstrations, will be the main venue, the CBC reported. Activists have reportedly said they'll occupy the site for several weeks. Organizers say they want to create a welcoming space to address the economic issues that sparked the movement. "We are also committed to safeguarding our collective well-being — including safety from interpersonal violence and any potential police violence," the organizers said on their website. Vancouver's Downtown Business Improvement Association has warned members to clear their display windows. "This is not business as usual," spokesman Charles Gauthier told CTV News. "We don't expect anything to go wrong but unfortunately there could be a criminal element that could take advantage of this." The Vancouver Police Department said it has talked to "self-identified organizers" and its planning for the weekend protest is continuing despite not knowing how many will show up. "Legal protests and demonstrations in Vancouver are welcome, and people are free to gather in any public space as long as their actions are legal," said Const. Jana McGuinness. In Calgary, protesters have already set up camp at St. Patrick's Island, near downtown. The city said it will assess the camp daily to ensure there are no health or safety concerns.